Books of the Week – June 4, 2011 | Tired, Need Sleep. Shark vs. Train and Shrinking Mouse look great! I'm going to see if our library has those. I hope you find your love again for the Little Engine That Could. My boys love it too. It occured to me the other day (but is probably old news to everyone else) that it loosely follows the story of the Good Samaritan. Anyway, thank you for the great book recommendations, always a blessing to find new books. I'd love to try out the rebus story, those are always fun. Do you use wegivebooks.org? It's a free ebook site. They have the little engine that could. That could be a fun format for reading it too. My son loves to read that story on the computer! The Little Engine That Could is one of our favorites here (with new illustrations). Sorry for not being too active with comments lately - work has been brutal. Thanks for joining WMCIR! Catching up on some neglected links. Thanks for linking up at Feed Me Books Friday! 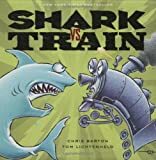 So glad you enjoyed Shark vs Train - thanks for the link-back! 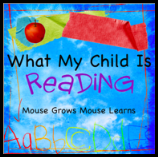 I think the Shrinking Mouse and the rebus story look great - off to look them up at the library!